Regular or Hot Fusion in progress. The most frequently asked questions on our Facebook Pages have something to do with Fusion, maybe because we have a lot of those pictures in our Photo Albums. More specifically, many want to know the difference between Fusion as we used to do it and the latest method called Cold Fusion. 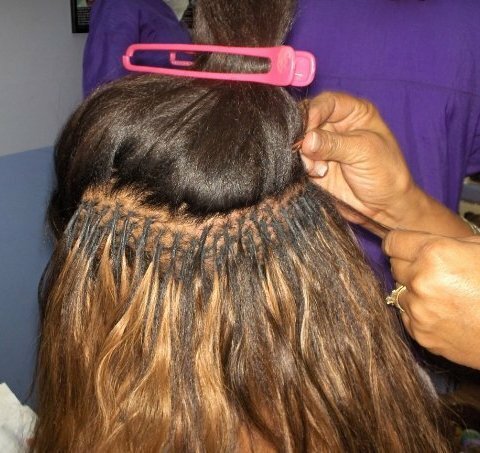 We have been using this method to add hair extensions for a few years now. It is preferred to the sew-in method because you do not have to feel the bumps in your hair caused by the plaits that are used to anchor the extensions in the traditional sew-in method. Although the sew-in method has and continues to achieve results that are quite satisfactory, the fusion method allows for a smoother finish and the bumps are no longer there. In this method we take portions of the extensions and bond them with portions of the clients hair, repeating the process in a pattern that results in the style that the client is desirous of having. The bonding is done by using special glue sticks that are heated in a gun shaped applicator such that as the glue melts it is applied to the point of attachment and that is how the extensions are added. This method differs from the original Fusion in one fundamental way. 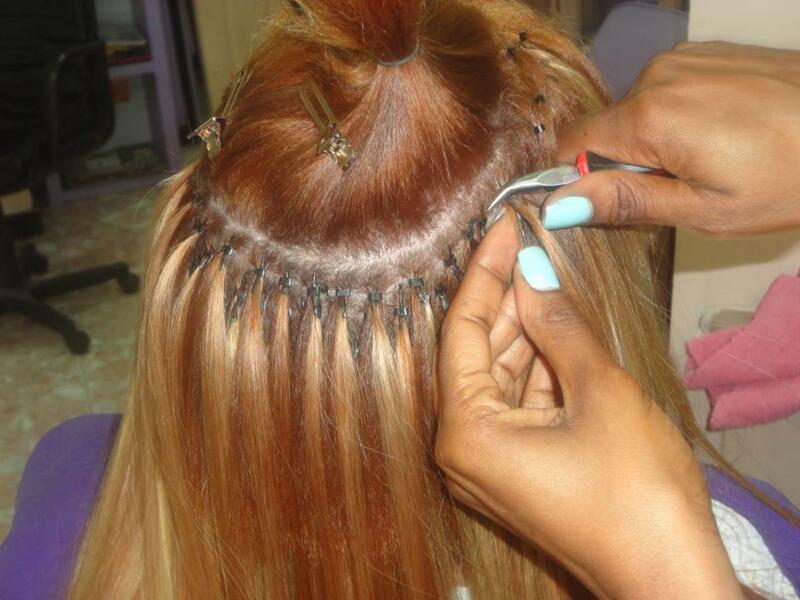 In this method the hot glue is not applied to the clients hair, hence the term Cold Fusion. Instead, the hot glue is used exclusively on the extensions, to form small pieces of hair. These pieces of hair extensions are then attached to the client’s hair using micro clamps. Special tools are required in order to accomplish this. The fact that no hot glue is applied to the client’s hair is deemed to be a positive and this method also has another advantage in that no chemicals are required to remove the extensions when that time comes. because we now us a mechanical method to remove the micro clamps. This method also allows for a shorter time to complete the process if the extensions are prepared before the client comes in for the appointment. Thus another step is created called the Prep for preparation. We usually encourage our clients who wish to do the Cold Fusion to bring in the hair at least a day before their appointment so that the preparation of the extensions can begin. The preparation does not have to be 100% complete but by starting it, the job is executed in a more timely and efficient manner. 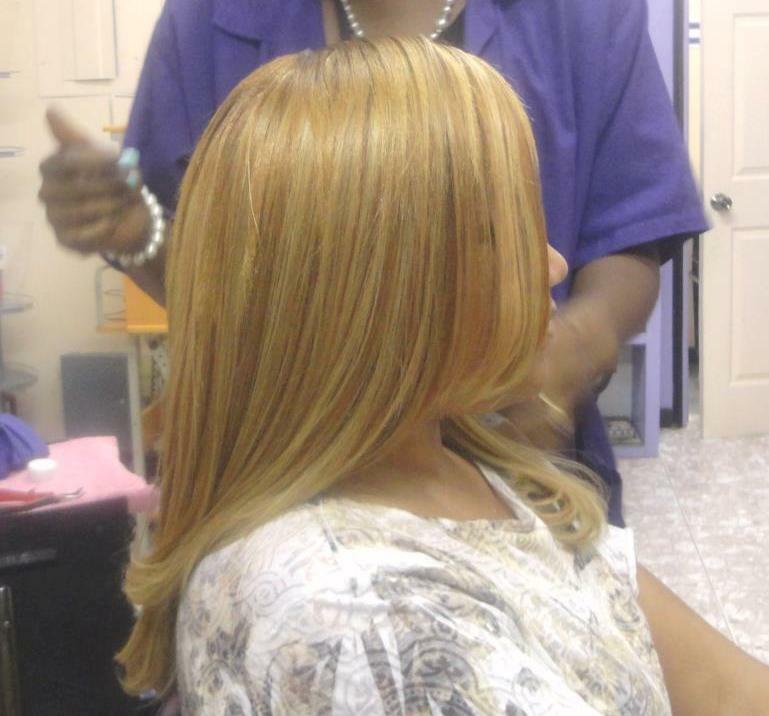 Even if the client wants us to source the hair for them, an arrangement can be worked out for this to be accommodated. It is now possible to get Fusion Hair, that is hair that comes already fused and can then be attached to the client’s hair using the micro links without us having to prepare it. The hair is machine bonded and there is therefore less chance of any shedding once the job is done. 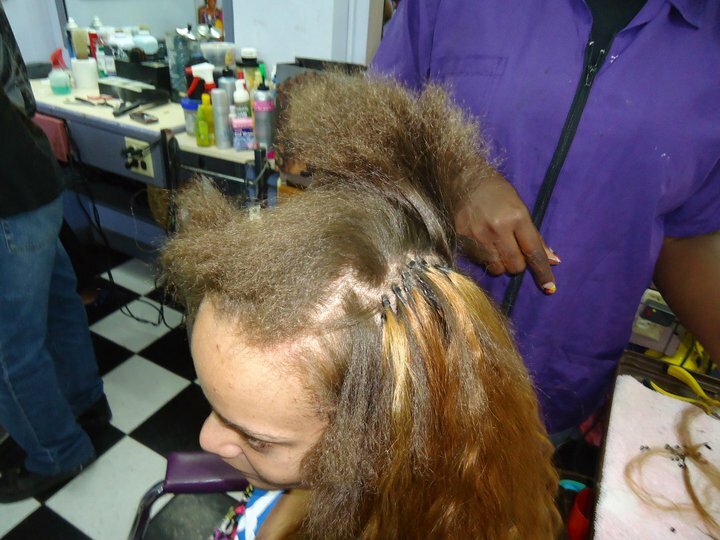 Shedding should not be a problem even when the hair is prepared manually but there is an outside chance which if it occurs is easily rectifiable. This fusion hair is not widely available in the supply stores in Jamaica but we usually have a few packs in stock so if you are interested in this process, it is sometimes best to secure the hair first even if you are not yet ready to do the actual process. In summary, both fusion methods can result in a smooth finished look that is devoid of any bumps that are inherent in the sew-in method of attaching extensions. Using the micro clamps in the Cold Fusion means that your hair is not subjected to hot glue and aids easier removal when the time comes as no chemicals are required to remove any glue. Finally, because in the Fusion process, the extensions are put in, in small strips and not as rows as in the sew in method, there is a more natural fall of the hair. Another observation is that whereas in a regular weave, a row will tend to move together, with Fusion, this does not happen and your hair falls and moves in a more natural way. In a future article I hope to address when it is best to use yet another method of attaching extensions, this one called Net Weaving. 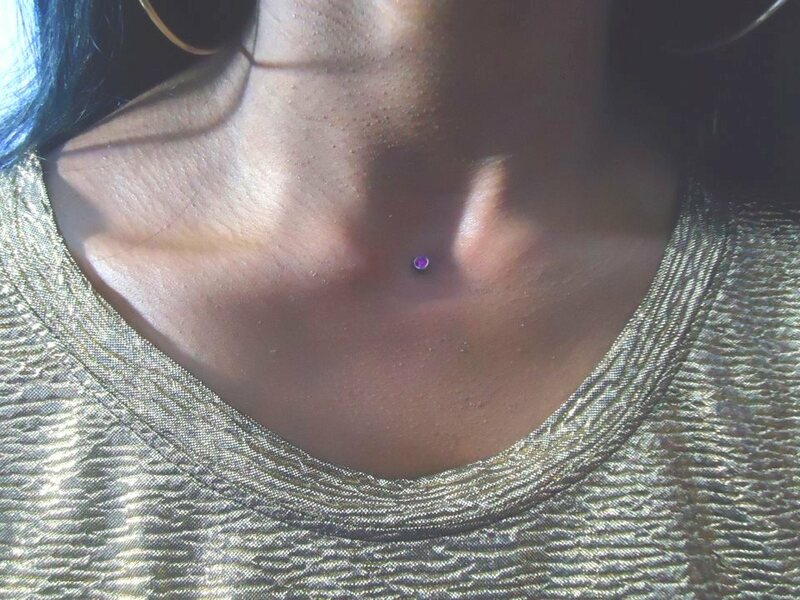 One of the questions that we are often asked is how long a particular piercing takes to heal so we have decided to post this information on our Blog for your convenience. It should be noted that these are just estimates and should be used as a guideline and not as something that is 100% certain. People are different and therefore we all do not respond to the same event in the same manner. Also, it is important to note that Aftercare is critical and the healing time will be markedly different from one person who is observing all the Aftercare Guidelines as well as proper hygiene as compared to another person who is not. If you do have an infection, the jewelry should be left in the piercing to allow for drainage of pus. If the jewelry is removed, the holes can close up, resulting in an abscess. LEAVE YOUR JEWELRY IN! Don’t use alcohol, peroxide, Betadine or Hibiclens as they are overly strong and drying which can hinder healing. Don’t apply any ointment such as Bacitracin, Neosporin or any triple antibiotic ointment on your piercing. These prevent oxygen from reaching the wound and form a sticky residue which can cause complications. They are not designed for use on healing piercings. Don’t over clean. Cleaning more often than once or twice a day is NOT better. This can delay your healing and irritate your piercing. Don’t use too many different products; select and use only one cleaning solution (such as Provon or Satin) plus sea salt. Avoid oral contact, rough play, and contact with others’ bodily fluids on or near your piercing during healing. 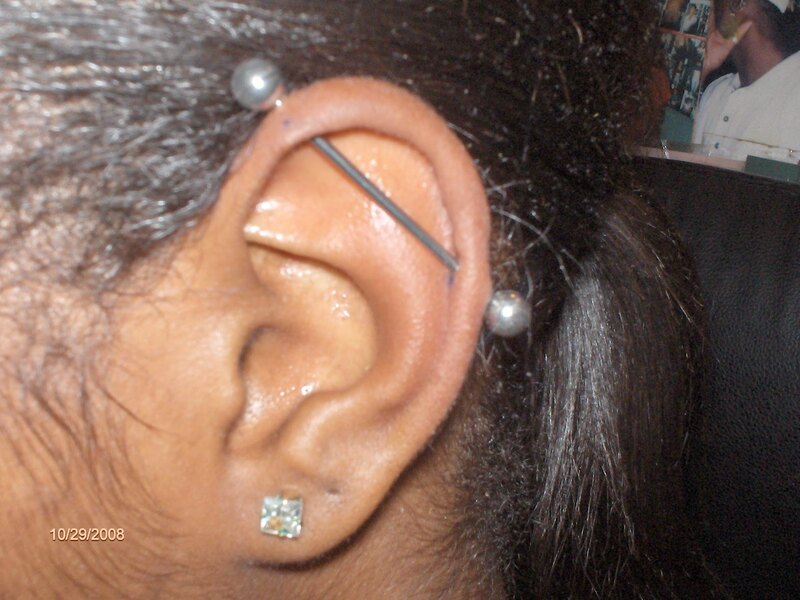 Don’t use band-aids on a healing piercing, they limit air circulation and the adhesive can irritate the area. Wash your hands prior to contact on or near the area of your healing piercing! Leave the piercing alone except for when you are cleaning it. It is not necessary or advisable to rotate the ring while healing except during cleanings. Leave the starter jewelry in during the entire minimum initial healing time! (Assuming your initial jewelry is appropriate in terms of metal content, style, and size. Inappropriate jewelry should be changed out by a professional.) Those with captive-style rings or barbells (straight, bent, or circular) can change the bead portion of the jewelry at any time. Check twice daily with clean hands to make sure the balls are screwed on tight on threaded jewelry such as barbells. Both balls tighten to the right. If you like your piercing leave jewelry in at all times. Even old, well-healed piercings can shrink or close in minutes after having been there for years! 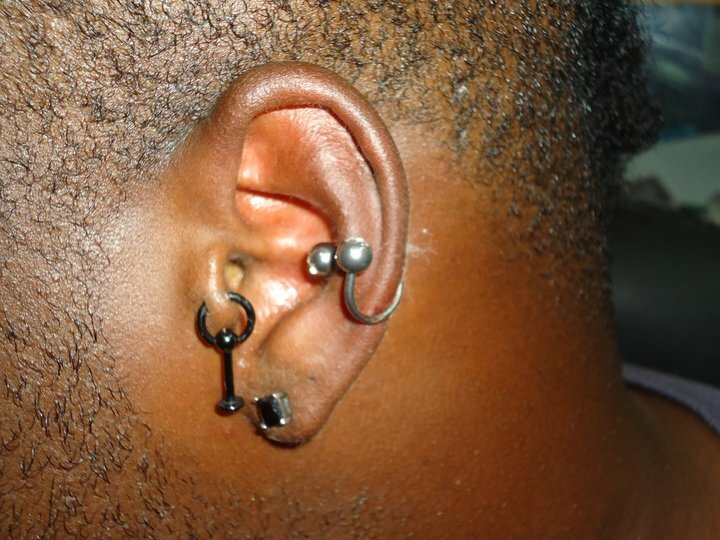 This varies from person to person, and even if your ear lobe piercings stay open without jewelry, your body piercing may not! 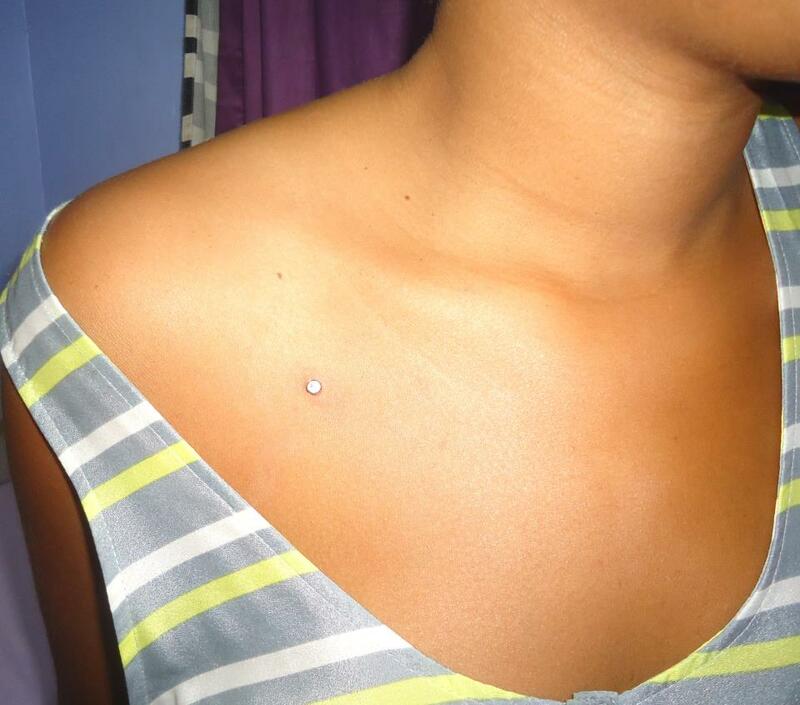 Contact your piercer if your jewelry must be temporarily removed (such as for a medical procedure). Monofilament nylon or another inert metallic substance may be able to be inserted to maintain the piercing until jewelry can be reinserted. Make sure your bedding is clean and changed frequently while you are healing, especially if pets get into your bed. 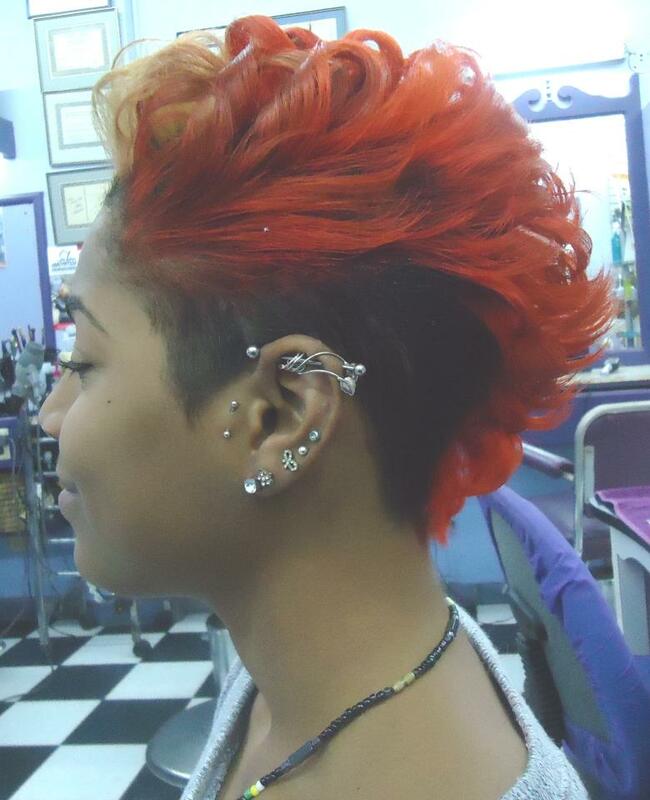 Wear clean, comfortable, breathable fabric clothing in the area of a body piercing. A multi-vitamin mineral supplement containing zinc and vitamin C may help boost your body’s healing abilities. Take it with your morning meal according to package instructions. Get enough sleep, eat a nutritious diet, and avoid undue stress, recreational drugs, and alcohol consumption. The healthier your lifestyle, the easier it will be for your piercing to heal. Showering is safer than taking a bath, as bath tubs tend to harbor bacteria. To bathe safely, clean your tub with a bleach product before each bath, and rinse the tub before you fill it. Also, be sure to do a running water rinse on your piercing when you are done in the tub. In the event that the piercing drains a thick pus discharge instead of the normal liquid secretion, you may wish to see a doctor. • Avoid tight, cinching belts and waistbands and inflexible clothing on the area during healing. • A hard, vented eye patch (sold at pharmacies) can be applied under tight clothing (such as nylon stockings) or secured using a length of ace bandage around the body (to avoid irritation from the adhesive). This can protect the area from restrictive clothing, excess irritation, and impact during physical activities such as contact sports. Buy 20 Ponstan, take 2 now, 2-4 hours later and then every 8 hours after. An alcohol-free antimicrobial or antibacterial mouth rinse should be used according to package instructions. Two examples are Tech 2000 and Biotene. These may be available in the oral medications section of your local drugstores. Check with your piercing studio; many studios sell those products for your convenience. Also: Mild sea salt water rinses. Dissolve a pinch (1/4 teaspoon) non-iodized (iodine-free) sea salt to one cup (8 oz.) Warm to hot distilled or bottled water. (Avoid hot water for the first few days). If you have high blood pressure or heart problems, you will need to eliminate the sea salt, and use only plain warm water rinses. Rinse mouth for 30-60 seconds with solution (see Cleaning Solutions above) after meals during the entire minimum initial healing time. Do not use more than 4-5 times daily and use it over intervals spaced throughout the entire day. Rinse mouth briefly (10-15seconds) with the mild sea salt mixture (see recipe above) no more than twice a day. If you are cleaning too often, the top of your tongue will start to turn a white to yellowish color. 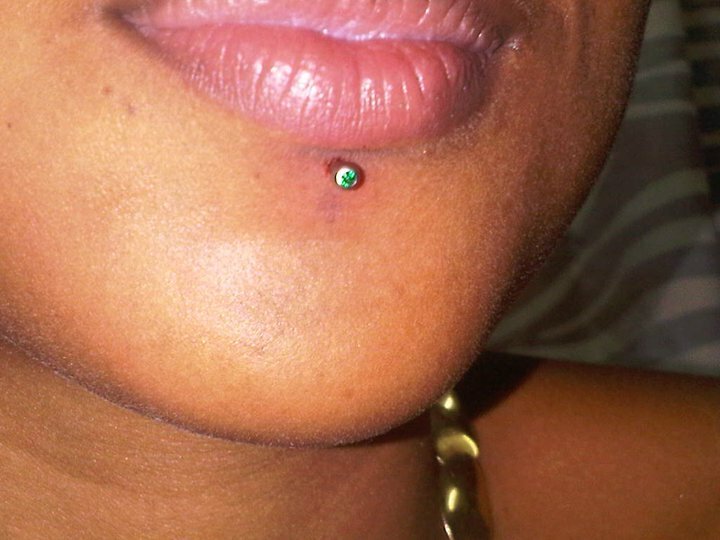 Continue to clean your piercing, but reduce the number of times you are cleaning it per day. A new soft bristled toothbrush should be purchased, to help reduce the bacteria that is introduced into your mouth. Swelling at the areas is perfectly normal during the first part of healing an oral piercing. It can be greatly reduced by gently sucking (rather than chewing on ice). Chipped or shaved ice or small cubes are best. The majority of the swelling usually lasts for only 3-5 days. Any new piercing can bleed off and on for a few days. There can also be some bleeding under the surface resulting in bruising or discoloration. This is perfectly normal and not indicative of any complications. 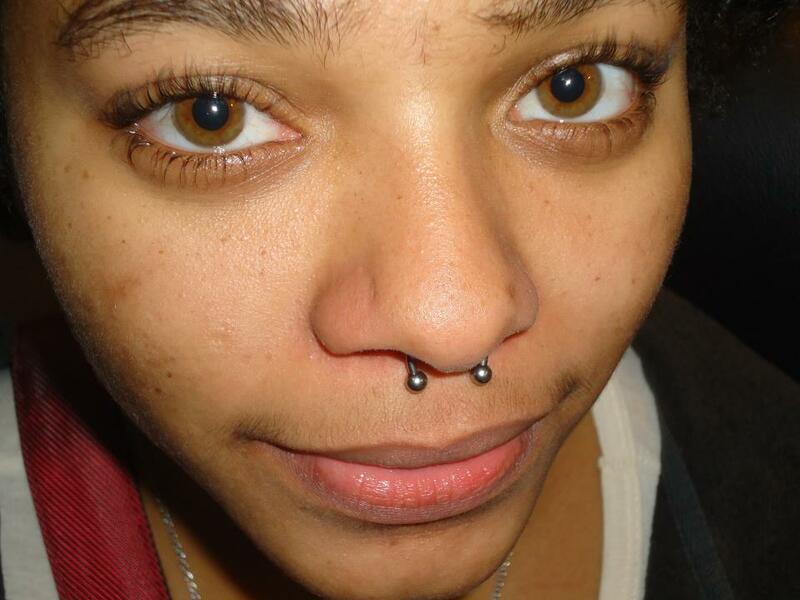 Some tenderness or discomfort in the area of a new piercing is not unusual. You may feel aching, pinching, tightness or other unpleasant sensations off and on for several days or longer. Don’t be alarmed if you see a fairly liquid, yellowish secretion coming from the piercing. This is blood plasma, lymph and dead cells which is perfectly normal. All healing piercings secrete, it just looks different inside the mouth as it does not have a chance to dry and form a crust as it does on ear or body piercings. This is not pus, but indicates a healing piercing. Plaque may form on tongue jewelry, commonly on the bottom ball and/or post. Scrub your barbell with a soft bristled toothbrush (gently during healing). If you are diligent with oral hygiene the jewelry will not need to be removed for cleaning, and it can usually be left in even for routine visits to the dentist. 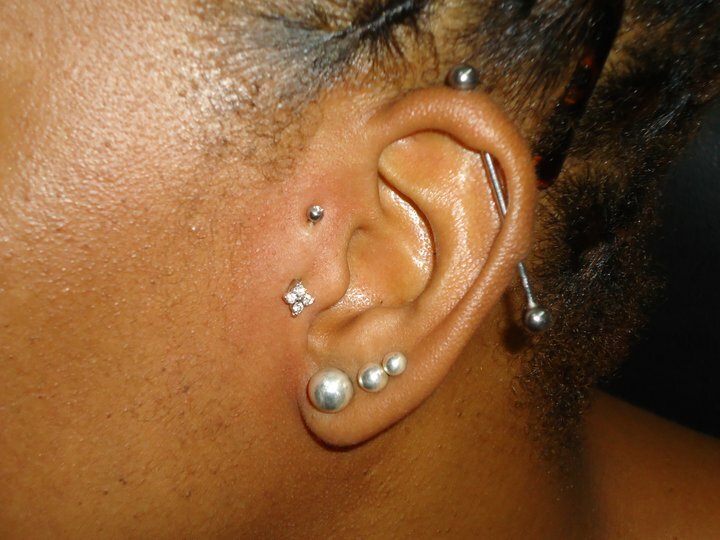 Piercings may have a tendency to have a series of ups and downs during healing by seeming healed and then regressing. Try to be patient, and do keep cleaning during the entire initial healing time, even if the piercing seems healed sooner. Each body is unique, and healing times can vary considerably. If you have any questions, please contact your piercer. Once initial swelling is down, having your piercer replace the post portion of bar style jewelry with a shorter post may be wise. Jewelry which fits more closely is less likely to irritate your mouth or get between your teeth and be bitten. If you like your piercing, leave jewelry in at all times. Even healed piercings can shrink or close in minutes after having been there for years! This varies from person to person, and even if your ear lobe piercings stay open without jewelry, your oral piercing may not! Keep following the care procedures during the entire minimum initial healing time, even if the piercing seems healed sooner. Stay away from hot temperature foods and beverages for a few days. Do not play with the piercing for the initial healing time beyond the necessary movement for speaking and eating. The mouth withstands a lot of trauma from normal speaking and eating. Try to avoid other disturbances such as excessive talking, actively playing with the jewelry, or clicking the jewelry against your teeth. Undue stress on the piercing can cause the formation of unsightly and uncomfortable scar tissue, migration and other complications. Even after healing, excessive play with oral jewelry can result in permanent damage to teeth, gums, and oral structures. Metal is harder than the human body; be gentle. Do not use Lysterine or other mouthwash which contains alcohol. It can irritate the area and delay healing. Don’t use too many different products; select and use only one cleaning solution (such as Tech 2000 or Biotene) plus sea salt. Some piercers will carry a spare ball in their wallet or purse. This is particularly advisable if you wear non-metallic balls such as acrylic, which is more fragile. If you break or lose a ball, a small piece of clean pencil eraser can be press-fit onto the post as an emergency measure. Do not place the barbell between your teeth and/or bite it. Try to sleep with your head propped up on pillows during the first few nights of healing; keeping your head above your heart will help to avoid much initial overnight swelling. An over the counter, non-steroidal anti-inflammatory such as Ibuprofen (Advil, Motrin, etc.) taken according to package instructions can reduce discomfort, and it can also help to diminish swelling the first few days. Check twice daily with clean hands to be sure the threaded ends on your jewelry are on tight. To clean hands, wash them with liquid antibacterial soap. If your hands aren’t freshly washed, don’t touch yourself above the neck during the initial time. Replace your toothbrush and make sure to keep it clean so that everything that goes into your mouth is hygienic while you are healing. Immediately after the treatment, you may notice the treatment area is red and swollen and will feel much like sunburn. 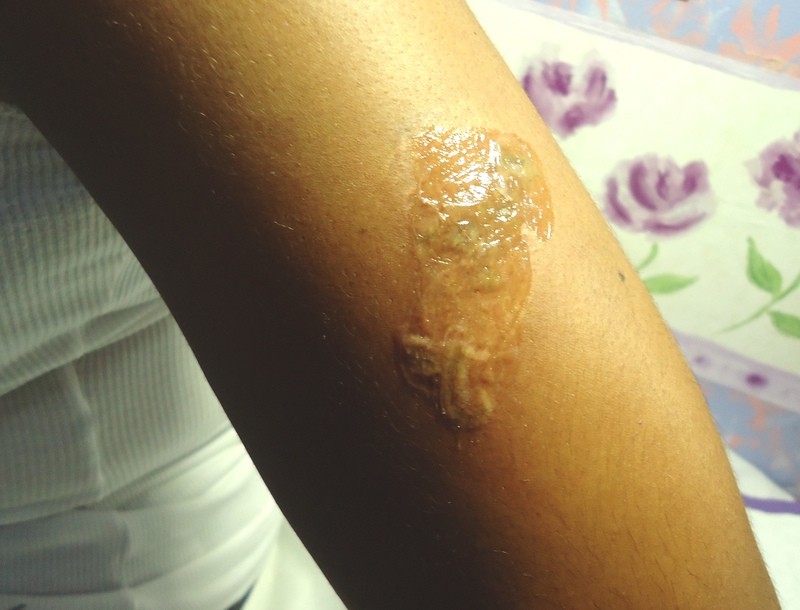 During the healing process, the area treated may also form a crust, scab or even blisters. This is all part of the healing process. Avoid removing scabs and let any blisters clear on their own. Failing to allow normal healing of the treatment area will increase the possibility of scar formation and can lead to infection. It may be necessary to use a dressing to protect the area if there is risk of damage. Upon completion of the process, a topical antibiotic ointment will be applied to the area and covered by a sterile dressing. You may apply cool compresses as necessary for 24 hours after the laser treatment to help reduce discomfort and inflammation. You may take plain Acetaminophen such as Tylenol to relieve pain but avoid Aspirin since it can increase the risk of bruising and/or bleeding. The morning after the treatment, the area should be gently washed with a mild soap taking care not to scrub the area. Thoroughly dry the area by patting dry, again, taking care not the scrub the area. Gently rub a fresh dose of antibiotic ointment into the area until it is well covered. Clean your hands well after applying the ointment, unless hands are part of the treated area. Cleaning and applying fresh ointment should be continued twice a day for 7 days. We suggest applying a sterile dressing for at least the first 48 hours after treatment and it can be used for the duration of the healing process if desired, changing it at regular intervals. In general, keep the treated area clean and dry while it is healing. Most activities can be resumed immediately after treatment however; soaking of the area is to be avoided as would be the case in swimming or lying in a bathtub, until healing is complete. It is very important that the area be protected from sun damage. As the area heals, newly formed skin will be more susceptible to sun damage. 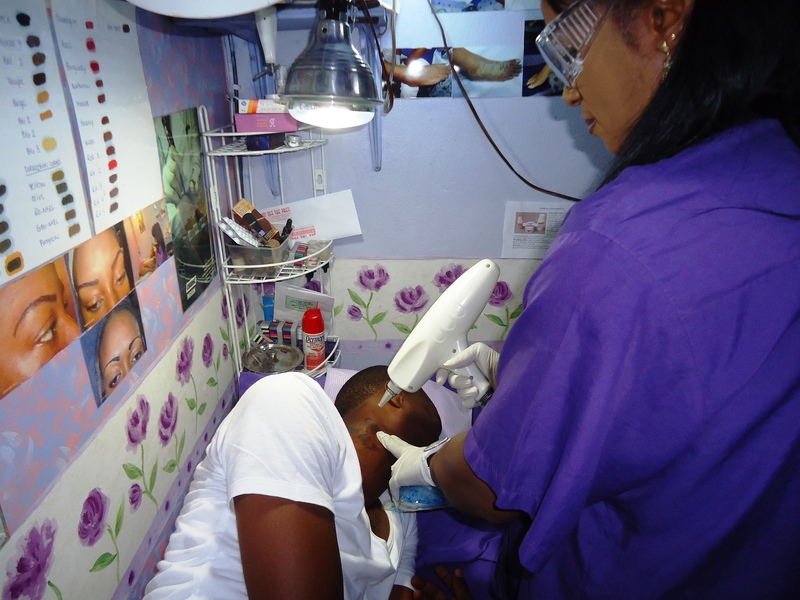 Under normal conditions, the process which breaks down the tattoo ink begins 2 weeks after the laser treatment. The ink will continue to be evacuated until about the 6 week post treatment mark. For this reason, treatments are scheduled no closer than 6 weeks apart. The number of treatments required to achieve a desired result will vary depending on various factors such as the depth of the pigments under the skin. Shaving should be avoided in the treated area until complete healing has taken place. It is not advisable to wear any makeup or use any unauthorized cream or medication on the area during the first 48 hours. You may wear a sun-block with an SPF of 25 or higher over the area for 3 months following the treatment if you are particularly susceptible to sunburn but not within the first 48 hours. If the area looks infected, such as any oozing or if you experience any unusual discomfort or bleeding; or if any other complications develop, contact us immediately. We may recommend that you see your own doctor. If you observe any extreme reaction such as moderate to severe facial swelling, moderate to severe rash, any difficulty in breathing, or if you are in any form of distress you should seek emergency attention. Salon Innovation does not accept any responsibility or liability for any negative reaction to this process as the risks as outlined are well known.